Right, I get it now. It's not even drugs. Some plane-traveling wizards came across the world of "A Miracle of Science" (link to the TV Tropes page about it rather than the comic itself because while the latter absolutely makes good reading in my book that's probably the better way to get a quick idea of what I'm talking about), hung around for a bit, and ended up coming back with bad cases of science-based memetic disorder. It all fits, I tell you! As for obvious a-wizard-did-it monsters, I'm genuinely surprised nobody's mentioned the gelatinous cube yet. Come on, nothing ever just evolves to naturally hold that kind of shape! The Wayback Machine remembers all! That's great! Thank you so much! I have been looking all over for these. Oh, I really like that idea, especially for some Bond esque fancy bad guy. I think that was made explicitly so in some article or book or something. The housecat, an animal that can cleave through common people like a hot knife through butter (at least in older editions). That sounds like something an archmage would create for a familiar that keeps the peasants at bay. Ogres are a failure because they are too stupid and hungry to do most of the work they were created for. Sahuagin are wizard creations according to Sea Devils. They were aquatic elves transformed to be servants and later were found by Sekola (sp?) who gave them their current culture. Buer, isn't it? Goetic demon? Originally, yes. 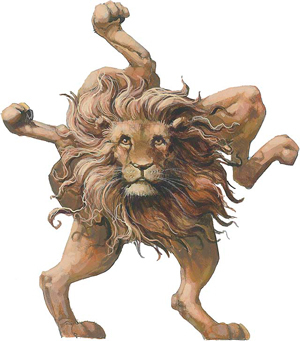 In D&D it's the roving mauler, a race of magical lions that roll over you ferociously. "You see, cub, when a lion and a wheel love each other very, very much..."
Thing is, the monster is based on the Goetic demon because they used that demon's design for one of the vestiges (spirits for the binder class) in that book. Then they made it into a species because that's what D&D does. Honestly, they would be better if they stunned you by trying to lecture you on formal logic (Buer's specialty). Well, we can explain it being a species by saying it was made by a cocaine wizard who worshipped Buer.